The Ryan Ranch Ruins at Lost Horse Well have intrigued me from the first time I saw them many years ago, whilst driving along Park Blvd towards a campsite at Jumbo Rocks. The stark, eroded adobe walls of the main ranch house have some kind of eerie allure that has drawn me to visit them many times since that first encounter. I like to park at Ryan Campground when the urge to explore and take pictures at the Ryan Ranch hits me. There are almost always open spots to park towards the back of the campground, and there’s an easy and well-marked trail (possibly an old access road) that leads right to the ranch. Hiking along the trail, there are some great views of Headstone Rock (a rock-climbers favorite) and several large piles of boulders to scramble on if the mood strikes you (I recommend exploring the rocks). A round trip to the farthest well site along the trail is only about a mile, but it’s easy to double that by wandering around all the interesting stuff to see. An interesting group of boulders to the right of the trail. Hmmmmm. There are a few rock piles along the trail that are worth exploring, and several really large ones along the base of Ryan Mountain off in the distance in the photo above. One of these days I'll head out to those and see if there's anything interesting to discover. The trail to the main ranch area is pretty short and it doesn't take long before I start seeing signs of the old ranching days. 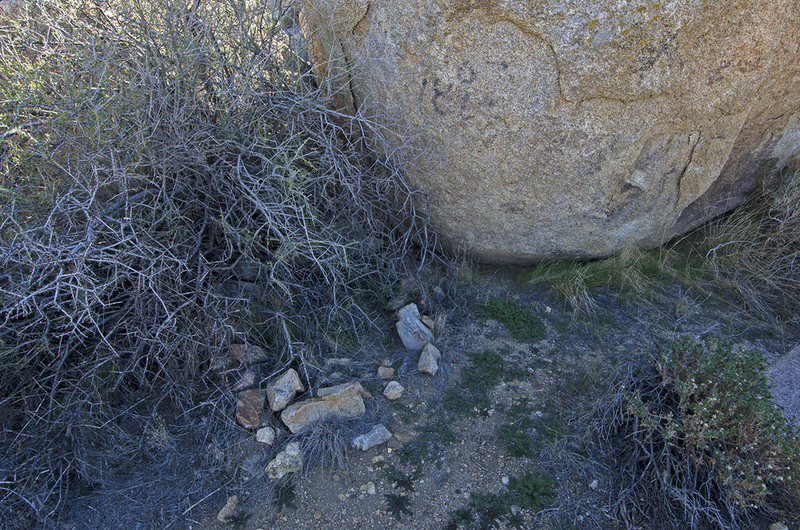 There are a number of old gravesites in this area and you can see on this boulder the date "1897." As I walk amidst the boulders here, I run across what appears to be several other grave sites. Reports are that there are at least 8 people buried in this area. There's what's left of the gate that probably once stretched across the road here. Following it to the left will lead to the main ranch house ruins but heading straight ahead along the barbed wire fenceline will lead to some interesting things as well. This trip I chose to head straight. The little white building in the distance is one of two pumphouses that used to pump water up from wells. All across the area here are the remains of the old pipelines that fed the ranch with the water it required to operate. There's all kinds of stuff to check out around Pumphouse #1. An old windmill which has long since fallen, the stonework water cistern, old engines and machinery, pipes leading off towards the ranch below and various other bits and pieces of a world that has moved on. Pumphouse #2 seems to be the highest point in the area with anything of interest. Off to the west is a very large water tank. Was it used to store water to be pumped to the Lost Horse Mine? Or was it a reservoir for the ranch complex? I don't know, but it's fun to guess. It's a BIG tank. After walking over to take a closer look at the water tank, I headed back down the trail to see what I could find around the ranch house. Check out the stone dam going across the middle of this picture. Water was precious out here and every opportunity to capture and use it was taken advantage of. Jepp and Tom Ryan homestead their ranch in the late 1890s to secure control of the natural spring once located here. They needed the water for their cattle and horses, but more important, they needed the water to operate the Lost Horse Mine which they owned in partnership with their brother Matt and local prospector Johnny Lang. As the mine was located some distance from the ranch, a 3.5-mile-long pipeline was constructed to deliver water to the Lost Horse. That was an amazing engineering feat at the time. The ranch complex must have been quite the site to see during its main time of operation. It reportedly consisted of the main house, an assaying cabin, a bunkhouse, and underground cellar, a horse barn and corral, wells and pump houses, windmill and a small stampmill. Some reports indicate that other homes and buildings were in the area, creating a small community sometimes referred to as "Langville." There were even said to have been three houses built entirely of Joshua Tree logs. That's all a stark contrast to what remains today, but that seems to be the fate of many pioneer outposts. The large adobe home, of which only this shell remains today, was lived in up into the 1930s. Local legend has it that mine tailings were used to make the adobe bricks used in its construction. Wood frame additions were made to the building over the years and it at one time had a kitchen wing attached to the back. Unfortunately, the ranchhouse burned during the night of August 12, 1978. The house was completely destroyed, except for the adobe walls. Arson was suspected, but nothing was ever proved. The walls have been treated to help slow their deterioration, but it's only a matter of time before the harsh extremes of the desert reclaim their kindred soil. Trail to the Ryan Ranch, and the farthest well and pumphouse. Lost Horse Spring, the reason for this spot of land being developed in the first place, was earlier known as Witch Spring. It was first claimed and occupied by James McHaney who later transferred his rights to George Lang in 1895. Lang later transferred his right to the land to the Lost Horse Mining Company. With the development of the Lost Horse Mine, the need for water became acute and in order to provide the mine with more water, a 70-foot-deep well was dug near the spring. And here's where the history gets amazing, at least to me. To get the water from the Lost Horse Well, a two-inch pipeline was constructed that ran 3-1/2-miles from the wells to the mine, where it was stored in an earth and stone reservoir sixteen feet by sixteen feet by twelve feet deep. The water was mainly used in the milling process. The pipeline was built around 1905 and many stretches of it are still visible. Two other wells were added at a later date and according to J.D. Ryan, the wells had a capacity of 5,000 gallons per day. In addition to providing the mine with water, Lost Horse Wells also served the Ryan Ranch and others who lived in the nearby vicinity. What an amazing place and story....and great spot to spend the day, to see what you can find. A stretch of the pipeline that brought water from Lost Horse Wells to the Lost Horse Mine. This picture was taken very close to the mine site. Checkout a short video of the Ryan Ranch and nearby surroundings! Please comment!